Ever since man first looked up at the sky, he was yearned to glide and soar like an eagle in the sky. Parasailing and Paragliding are indeed, experiences that combine the wonder of smooth sailing in the air and the thrill of soaring high above the ground. Once in the air, one may experience the ethereal serenity of the sport. It is an experience that is surprisingly, thrilling as well as becalming. Para gliding uses "thermals' as the driving force, and is the closest one can get, to being a bird. In perfect weather conditions one can stay aloft for over three hours and can soar to heights more than 3,000m. One can paraglide or sail if one is in normal health and do not suffer from any disability that would prevent one from say, driving a car. And yes, one must be over15 yrs or have the consent of one's parent/ guardian and one's weight should be between 45 and 85 kgs. 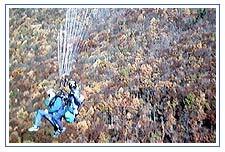 Garhwal is a Paraglider's and Parasailor's paradise. In the north one has the huge ramparts of the great Himalayas and in the south are the plains of the Terais. 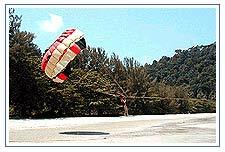 The unique geographical position of Garhwal provides excellent conditions for all grades of paragliding and parasailing, from beginners to intermediate and advance. The hot air coming from the Gangetic plains and the cold air from the hills creates excellent flying conditions. The climate of the region is also best suited for the purpose. The flying season spans September to December and then March to June. The GMVN Aerosports Centre is ideally located, in Dehradun. The Doon valley sandwiched between the Himalayas and Shiwaliks, with the Ganga and the Yamuna in the east and west respectively, is a perfect location for Aero Sports. All the facilities and infrastructure is in place to give sports lovers the ultimate experience of flying. The state-of-the-art infrastructure for both parasailing and paragliding is also available for the beginners who want to learn the sport. Certified instructors using the best and safest equipments provide instructions. It is an easy sport to learn, and one can go solo gliding the very second day! To reach the intermediate level it takes a minimum of seven days of flying i.e. about 25 sorties. The training courses conducted by GMVN include all the aspects of ground school time, basic & advance flying and special maneuvers. In the state of Himachal Pradesh there are numerous launch sites for professional as well as amateur fliers. Billing in the Kangra Valley of Himachal Pradesh is a fantastic location for hang-gliding and paragliding. It is also the most famous spot in the country where an international event takes place each year, bringing in paragliding enthusiasts from all over the world. The Dhauladhar range at 20,000 feet and the Kangra valley below create an ideal location for high altitude and cross-country gliding. This location is special because when you take off from the top, the fall is about one kilometre. An average flight, once you take off lasts an exhilarating 25-30 minutes. The GMVN Aero Sports center offers: Joy rides, training flights and flying expeditions. The parasailing courses are 2-day certificate courses leading to a learner pilot certificate or a basic pilot certificate. The center also offers package tours, which would include registration, training, food, accommodation, and local transport. Himachal Tourism sponsors training programmes and events at various times of the year, in different places. There is an Adventure Sports Hostel at Dharamsala and an Aero Sports Complex at Bir. For details of training facilities, contact sports associations, or the Divisional Tourism Development Officers of Himachal Tourism. Note: - The schedules are subject to uncertainties of weather, therefore please confirm your schedules before making any travel plans.